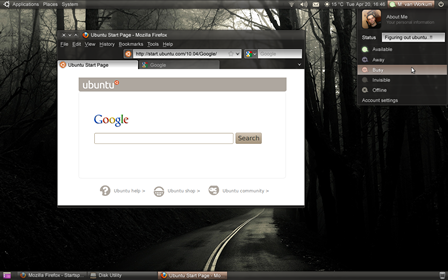 It all started early 2010 when I got tired of looking at the theme offerings of Ubuntu 10.04 and before. It wasn't particularly about the graphics of the desktop itself, but because the inconsistencies within the interface that made me decide to jump in and draw (and code) something myself. 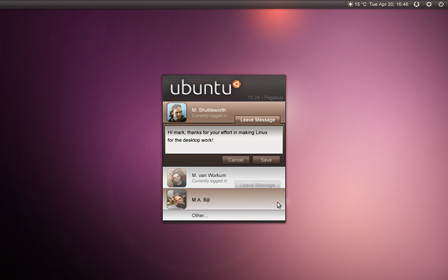 After envisioning this "better" theme for quite some time, Gnome 2 had come to an end and Canonical came with Unity to replace Gnome's new offering. Basically telling me to stop and revise everything. This switch to Gnome Shell and Unity made me rethink my idea's and vision. As mentioned all over the Internet neither Gnome Shell and Unity are being happily accepted. Although both are starting to mature, they still lack somehow. That's where my ideas shifted from my initial goal. Instead of theming one of those new "experiences" I became fascinated by creating a new one. Rethinking all what was the Linux desktop and especially how it could be, use what is great and fix where they got it wrong. Why does somehow using a computing device always end up in frustration? Why does it always seem to do what we don't want it to? So to continue this journey I decided to re-energize and take this project a step further and create this new concept. Recreating, redefining and redesigning my previous efforts and the current leading desktop environments with the help of the community, with you guys! This is when Symphony was being (re)born. So if you feel you can contribute in any way, please let me know in the affiliated forum page, feel free to constructively criticize and appraise my ideas and, of course, bring some of your own! Think about it, how awesome would it be to come home with your newly bought tablet and just after powering it on being able to control your light, listing to your music on your stereo while watching the contents of your refrigerator on your TV all controlled from this device without having to do anything but let devices accepting each other? Nothing to configure, just a simple accept would suffice to open up an experience beyond everything you know today! This would be the ultimate goal, to create this ecosystem, unleashing an awesome experience across (high quality custom made) devices that just work, using nothing but open technologies! Think of it like Apple's interface and hardware devision mixed with Canonical's open source incentives and using only open source (drivers) hardware and software to power a wide range of devices. From tablets, phones, TV's, home automation to refrigerators joining everything together in a non restrictive and open way! All of this being backed by a possibility within the cloud or self hosted solution for shared authentication, settings, machine profiles, backups, virtual desktops, storage, you name it, across all devices giving you complete freedom and control. Usability, design, integration and freedom all boxed for your convenience. If this really takes off I will eventually try to get funding, possibly as a Kickstarter project to completely dedicate myself to this vision and get others to help me. At this moment this page is basically it. I'm constantly monitoring this thread at the ubuntuforum, challenging your comments and using them to make my vision a reality. I've also create a Google+ page dedicated to this project creating a better way to keep you all informed and able to react more specific to announcements. Please subscribe to (follow) it as I will use it to anounce all changes, additions and follow-ups. For now this page shows you some basic image mock-ups of Symphony in it's infancy. All of these will include a description of it's contents and how it is suppose to work. Feel free to ask me if it's unclear, plain stupid or if you have some better idea's. I'm currently focusing on the status/state of the computer/device. The current screens will only reflect this part of the desktop. The launcher, workspace and window management will come later. Stay tuned! Example of the system state bar. This section will show all current status information about the computer/device and exposed output/input from external storage to sound and display output. It's basically a combination of the notification and system-tray menu's used in the current operating systems. Notification count, network connectivity, display output, sound output, attached devices, power usage, time and user state. Example of the system state bar opened by clicking on the notification count or by closing the accordion options. The state bar incorporates a notification center to review missed notification, it has (for now) 2 types of notifications. The slightly darker ones are time based and are of no usage after a configurable time option, these will disappear after this time out. The brighter ones are of importance to you, these ones will not disappear unless you remove them yourself. Which notifications are timed and which ones are not will be configurable within the settings. Still considering using this area to display ongoing processes, like file copying etc. but for now I lean towards the way Unity handles this. Example of the system state bar opened by clicking on the number or by closing the accordion options. Basically the same mock-up as the previous one, but all notifications are removed by pressing the close button on the notification section. Example of the sound state bar opened by clicking on the speaker or by opening the accordion option. The basic idea behind this concept it that it should expose all running applications capable of producing sound with there own volume control. To take this a step further it also should allow you to simply output system sounds or even a certain application to another output device locally or within your local network. The same goes for the other way around, this mock-up also features an input stream from an external device. This can be closed directly from within state bar. (The green arrow on the icon on the right will indicate it's outputting to a none default output). Example of the sound state bar opened by clicking on the speaker or by opening the accordion option and selecting another output. As mentioned in the previous image. This is an example how you would select another output for your audio streams. All systems using Ubuntu Symphony should expose itself as receiving device without having it to turn on. (Depends on privacy / network settings). This will ensure people are aware of this feature as soon as they have another device running the same OS. If, for example, your system is selected by someone to output audio, you will be asked if that user / machine is allowed to do so. Example of the display state bar opened by clicking on the monitor or by opening the accordion option and selecting another output. This is basically the exact same thing as the audio section but applied to the visual output. You should be able to select an output to all kind of display's attached to your device or within your local network. Allowing you to clone your output to a beamer or view your video on a TV. It even allows you to use your laptop as a second monitor! If, for example, your system is selected by someone to output video, you will be asked if that user / machine is allowed to do so.